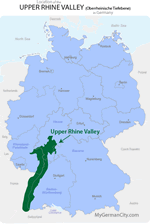 Germany’s Upper Rhine Valley, or Rhine Rift (German: Oberrheinische Tiefebene), is a land right out of the fairytale books. The Valley begins where the Rhine enters Germany at the sunny Dreiländereck (three-cornered country) in Weil am Rhein. It is bounded on the west by the Rhine, across which lies the Alsace region of France, and to the east by the majestic Black Forest. Following the Upper Rhine Valley north from the town of Lörrach until you reach the city of finances, Frankfurt am Main, will give you a taste of all the best (including wine) which Germany has to offer! Although Lörrach may not be quite as important as it was on the September day in 1848 when Gustav Struve’s revolutionaries proclaimed it the capital of Germany, you will get a taste of things to come by visiting the hillside ruins of Castle Rötteln. Its pink stone towers are hard to miss against the surrounding woods, and the view from its highest walls is staggering! If you prefer to stay closer to the Rhine on your journey north, head from Lörrach to Freiburg im Breisgau, Germany’s sunniest city. Founded in 1120, it’s been famous since medieval times for its splendid university and astonishing Münster, said to have the most beautiful spire of any Christian church. There seems to be a different festival of fair, celebrating the arts, the local wines, or the city’s history every week in Freiburg! Visit the Carnival Museum for a closer look at Freiburg’s festival traditions. Just 17 km or 10 miles north of Freiburg is the town of Emmendingen, where you’ll find the medieval ruin of Cornelia Schlosser’s Hochburg. She was the sister of Germany’s great poet Goethe, and he often came here to visit. Emmendingen is also within easy hiking distance of the vineyards of the Kaiserstuhl Mountains, and a short drive from the Europa-Park at Rust! The next stop on your sojourn is Lahr (Schwarzwald), located at the intersection of the Upper Rhine and Schutter Valleys. Come here in October and November, and the entire town will be ablaze with the autumnal colors of the Chrysanthema Flower Show. The moms are replaced every spring by Hyacinth, tulips, and daffodils while in the summer months the roses hold center stage! Looking down on them all is the 13th-century Stork Tower (Storchentrum), once part of the Tiefburg castle. A climb up Schutterlindenberg Mountain will earn you the view of the Upper Rhine Valley across the river into Strasbourg. The Zoological gardens are marvelous for families with children! Head 24 km or 14 miles further northeast to the heart of wine country and the town of Offenburg. As you’ll see from strolling through its may green areas, this is another city which loves its flowers! Offenburg, directly across the Rhine from Strasbourg, is full of historical buildings! They include the Salmen Inn at which, prior to the 1847 revolution, the thirteen planks of the Offenburger human rights platform were presented. The Casino Baden-Baden, at 185 years old, is the oldest casino in Germany. Dostoevsky wrote his novel “The Gambler” after losing not only all his money, but his coat and shirt one night at this casino! Spend an enjoyable afternoon visiting the tasting rooms of the Baden-Baden wineries. The next stop of your journey through the Upper Rhine Valley or Rhine Rift will be at the “modern” town of Karlsruhe (founded in 1715!). The streets of this beautifully designed city radiate out from the baroque Palace grounds and gardens at its center. Margrave Karl Wilhelm created the palace complex, which now includes botanical gardens and the Baden State Museum, in what was originally nothing but forest! Even more famous than the palace is the Karlsruhe Pyramid in the market square, where the Margrave is buried. Mannheim and the Rhine-Neckar region is another important stop on your route, proudly presenting a number of classy castles and villas along the Neckar river. Once you’ve reached Frankfurt am Main you’ve come to the northern tip of the Upper Rhine Valley. The rather flat land spreads west and east around here up until the first depths of the Main river.